With the reports of participation pouring in across the globe, the World Cleanup Day is now counting in at 158 countries and territories, with a total number of 15 million participants joining the biggest waste collection day in human history. 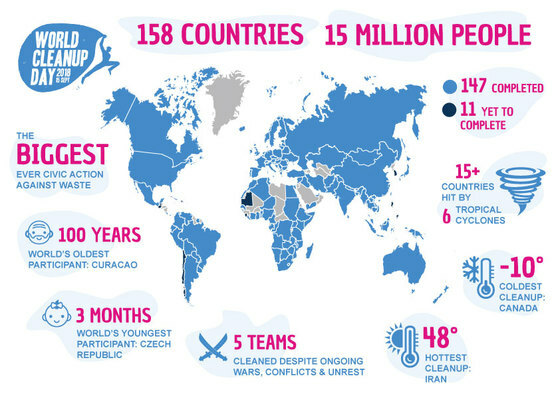 With Cape Verde, Ethiopia and French Polynesia joining the party, the total number of countries and territories involved in World Cleanup Day has grown to 158. The total number of volunteers taking part in the action has risen to 15 million, as the final reports are still coming in. The green wave of cleanups began on the small island nation of Fiji in the morning of 15 September, sweeping across the planet, despite the challenging weather conditions in some regions, and finishing in American Samoa, who joined the day of action just a mere 12 hours before. With 6 tropical cyclones affecting more than 15 countries in different parts of the world, several countries and many regions had to reschedule their cleanup actions to ensure the safety of people involved. “I truly admire the courage of our team leaders in different countries who have brought people out to act for change, amidst the storms, unrest and other very severe challenges. This day was a day of hope – that we can act together as humanity to create a better tomorrow. This needs to be matched up by efforts from our political leaders, policy makers and enterprises to shift from a waste-creating and waste-tolerating society into an efficient and resource-conscious one,” said Anneli Ohvril, a member of the managing board of the Let’s Do It1 Foundation, propelling the World Cleanup Day. World Cleanup Day is propelled by the civic movement Let’s do it! World, which has been initiating cleanup actions across 113 countries throughout the last decade, with now over 35 million volunteers taking part in total. Let’s do it! World has also proven to be a movement of peace and bridge-building. “In many countries and regions, this cause has already united groups and cultures that have been defining themselves through differences, bringing with it not just cleaner and healthier environments, but also a realisation that true cooperation and understanding is possible,” added Anneli Ohvril, a member of the managing board of the Let’s do it! movement. World Cleanup Day stories from different countries and more information about the results are available on the website. The World Cleanup Day Live Show, which ran 24 hours non-stop, was hosted by Irish TV presenter and producer Colm Flynn and TV presenter Zihlo Ndlovu from Zimbabwe and is available for viewing on YouTube. All the original content in the channel is free for media to use.